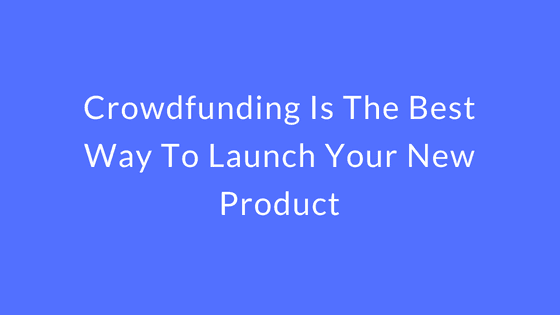 This article aims to explain WHY crowdfunding really is the best choice for launching a new product, even if you are an established company with a strong brand or a new start-up trying to get your dreams off the ground. Before getting into the reasons why you should be taking full advantage of crowdfunding, you should know that most crowdfunding campaigns fail due to not meeting basic standards of success. Your product needs to be good – It wont raise money if it has been done before and better. You are an expert at crowdfunding yourself or are working with an agency like Joopio that can do all the heavy lifting for you. You MUST have an advertising budget. If you are doing these three things, we can confidently assume that your crowdfunding campaign will be successful. Crowdfunding campaigns are low in risk & cost and can provide some invaluable market research about your product (if you’re ready to listen to all the faults with your idea). One of the most valuable things to come from a Crowdfunding campaign is the customer feedback and advertising data, the information that can be gathered will show you who is the most receptive to your product, and who is not. How will your customer receive your product? What questions/concerns do they have about your product? Customer questions can lead to breakthroughs, and advertising can reveal new demographics that have been previously unthought of. The HUGE advantage of crowdfunding community is that the ‘backers’ know that your product is in development, and are willing to invest time, money and thought into it to see it improve for their own benefit. Including them in the process has proven to be invaluable to many other crowdfunding campaigns, and could be for yours. The backers of Kickstarter and Indiegogo are Early Adopters of technology, they want the new disruptive technology FIRST, so that they can either lord it over their friends & family, or just for the love of tech. Regardless of why they want to back your ingenious project, they are lovers of technology, ready to embrace whatever weird and wonderful idea you have…unlike most people. There are HUNDREDS OF THOUSANDS of unique visitors to Kickstarter and Indiegogo each month, these websites are vibrant communities that are bursting with potential customers. All you really need to do is find your audience within their communities, make a small piece of their traffic yours and you will achieve great success. WHEN you project gets some well-earned traffic through advertising and other marketing efforts, the platform will begin to promote your campaign itself and gain you more traffic for FREE. Who doesn’t like free traffic? Crowdfunding is proving itself to give the ROI on your advertising budget, the conversion rates are significantly higher in comparison to e-commerce websites, and a higher conversion results in lower cost per acquisition, making your marketing money stretch even further. What is necessary for this model, is a working prototype and a fantastic marketing plan (hence the need for a professional agency like Joopio…wink wink, nudge nudge). You can then include your audience in the validation process before you invest in manufacturing. Once you have a successful crowdfunding campaign completed, you have proved that there is a high demand for the product, which can help you close larger volume deals with retailers or expedite potential licencing deals or even sell your company. You should also be trying to leverage your success for press coverage, crowdfunding is social and your success can be shared across social media by your new community. Crowdfunding and the social aspect of it is ideal for validating a product, building a community and see some serious revenue flow into the company all within a handful of months. The sooner you start your own crowdfunding campaign the better. Your campaign is not over when the campaign time runs out. That deserves a second read. There is a substantial opportunity to upsell anything you want to your backers, when your campaign is over and you are contacting customers for order information, you can reach out to your customers and offer add-ons and accessories for the product. Crowdfunding clients have doubled their funds with post-campaign efforts. You can still sell whatever you want during post-campaign efforts, you can even offer companies the opportunity to move excess inventory, they are able to sell anything they want through post-campaign efforts because they are not associated with Kickstarter or Indiegogo. Another important thing to remember is that campaign success can improve exponentially after a successful launch. Companies that have the ability to develop new products quickly are seriously missing out when they do not incorporate crowdfunding into their annual sales/marketing, they can ride the wave of success to new heights. If you would like to learn more about how we can help you, just click here.